Novelty soap. 2.5 oz. One size fits most. Large or small or inbetweener...nothing beats a cleaner weener! 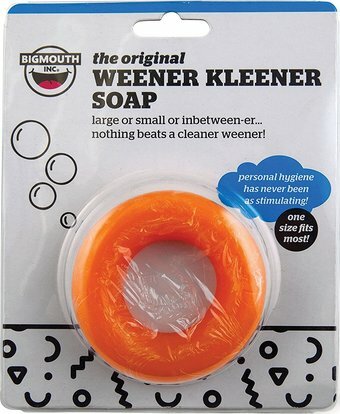 Weener Kleener Soap is shaped like a donut for easy use. It solves that age old bathing dilemma and adds a glorious "hole" new dimension of pleasure and fun to a shower or bath. This stimulating soap ring makes a hilarious gag gift for a husband, boyfriend, or buddy who just got dumped...or, what the heck, treat yourself to some good, clean fun. The soap is light orange and weights 2.5 oz. Caution: If Weener Kleener ever becomes stuck, soak area liberally with ice cold water!